Why would you want to join Midwest Triathlon Coaching? - How much volume? Swimming vs. biking vs. running? - How often to train the three sports and how hard should the sessions be? How about strength training? - Spend valuable time training, not trying to decide what to do and when to do it. - Avoid costly mistakes such as buying the wrong equipment or signing up for the wrong race. - The Team gets some great discounts on things you already buy. - With a Coach inspecting your training log, it provides the extra push needed when motivation sometimes starts to slip. - Have a plan that has been built by a professional that takes into account your busy life. - Every workout has a purpose that is moving towards your specific training and racing goals. - Get to know other MTC athletes at training events and races. - Develop training buddies and long term friendships with like-minded people. - Arrive at the start line knowing you have done the right things to prepare and are truly ready to go! These coaching service levels have been developed over the years based on the feedback and needs of athletes. If you have questions or are looking for something else please contact us. This is the most common plan and suits the needs of most athletes from Beginners to Ironman. Want to see your coach more often? Looking to get better results in a hurry? This is the plan for you. The coaching relationship as a true partnership between coach and athlete. 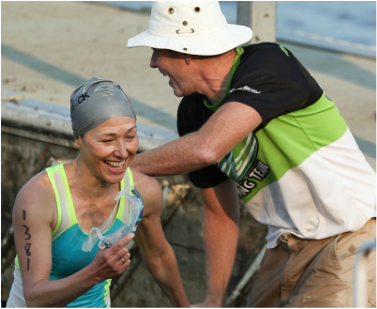 The journey belongs to the athlete; a coach is part of the team that also includes family and friends all working together to get the athlete ready for race day. Athletes must be clear about their goals and expectations; a coach helps them realize what is believable and achievable. A good triathlete is a balanced triathlete: swim/bike/run or life/work/sport. Getting fast and "going long" takes hard work and consistent effort; "overnight successes" are few and far between.